This recipe freezes extremely well, so you can make them up ahead, freeze either whole or portion and freeze individual portions. If freezing make sure you wrap them well, as the egg mixture will pick up freezer odors if not wrapped tightly. 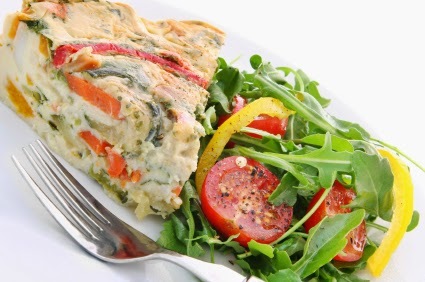 To reheat from frozen, microwave on low for 1.5-2 minutes for individual pieces or oven bake at 350° for 10-12 minutes. While we make everything fresh to order at the Rosewood, we have shared this recipe with others and have gotten great feedback about how well it freezes. 1 lb. premium smoked salmon broken to medium to small pieces. Ducktrap Farms makes a very quality smoked salmon, hot smoked salmon can be used as well as a substitute or smoked mackerel or trout. 1 lb. shredded sharp cheddar, Cabot is recommended. 1. In well greased spring form pans, or alternatively, spring form pans lined with parchment paper, alternate salmon, cheeses and peppers until well distributed between both pans. Pour the egg mixture over the top until it reaches about 1 inch below the top of the pans. 2. Bake for approximately an hour and a quarter or until the pans when shaken lightly don’t wiggle in the middle. Baking time will vary depending on electric or gas ovens. A knife when inserted into the middle should come out clean and warm to the touch. If serving immediately, let set on the counter for about 10+ minutes.